Chinese chess is rapidly gaining popularity all over the world, find out why! 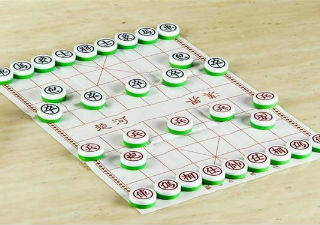 Chinese chess, also called Xiangqi, is one of the most popular board games in China. It is also a popular pastime in Vietnam, and there are a growing number of players in the United States as well. Chinese chess does also have its fair share of differences to international chess. 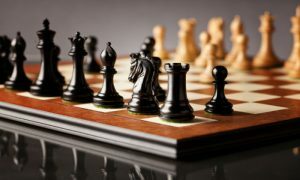 For example, it includes rules that prohibit two generals from facing off against each other directly, and there are special areas on the chinese chess board itself that affect the movement of certain pieces in different ways – enhancing some and inhibiting others. 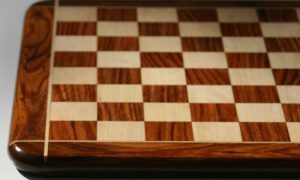 At a glance, one would also notice that the pieces are placed at the intersection of lines on the board, rather than within the squares themselves, as in traditional chess. Now that your interest has been piqued, let’s get to the chess sets! 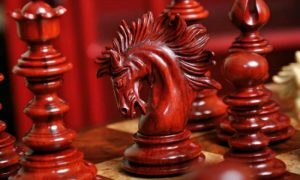 All of the Chinese Chess Sets on this curated list have been selected from reliable and trustworthy US-based stores with reasonable prices for quality products. This Glass Chinese Chess set is a delight to play on and just to display in your home or office. The smooth and simple design of the glass gives the set an overall elegant feel that works with any kind of decor, from traditional to ultra-modern, or even industrial. 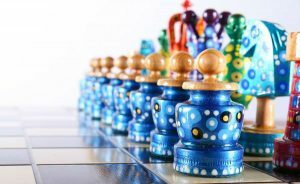 The Glass Chinese Chess Set is being sold by ChessUSA, which is one of the biggest and most trustworthy online chess stores in the US. You won’t need to worry about getting cheap, low quality, or knock-off sets from them! 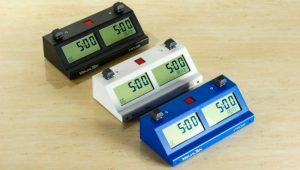 In fact, if it weren’t for the sterling reputation ChessUSA has built up for itself in its many years of doing business, you might even think this deal is too good to be true, since the price of this Xiangqi set is so low. Even being one of the more expensive Chinese chess sets on our list, it is still very affordable, and cheaper than most of the traditional chess sets we’ve reviewed. If you’re switching over to Chinese chess from Western chess, you may be pleasantly surprised at the amount of bang for your buck you’ll be able to get. 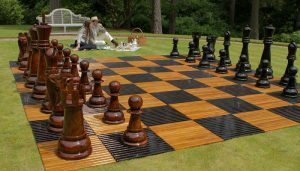 Top of the line Chinese chess boards are generally much cheaper than top of the line traditional chess sets. 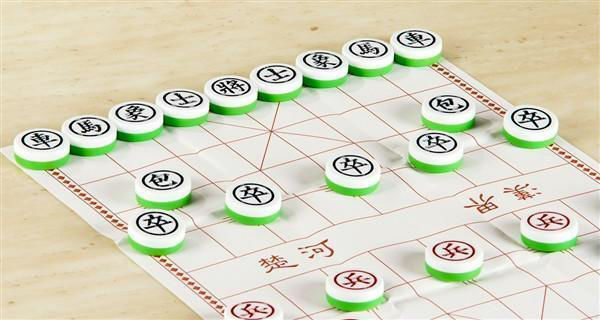 This compact and portable chinese chess set is perfect for travel. It has a folding board and magnetic pieces, which make it just the thing for playing a quick game on a plane, in the car, or anywhere else you may find yourself! 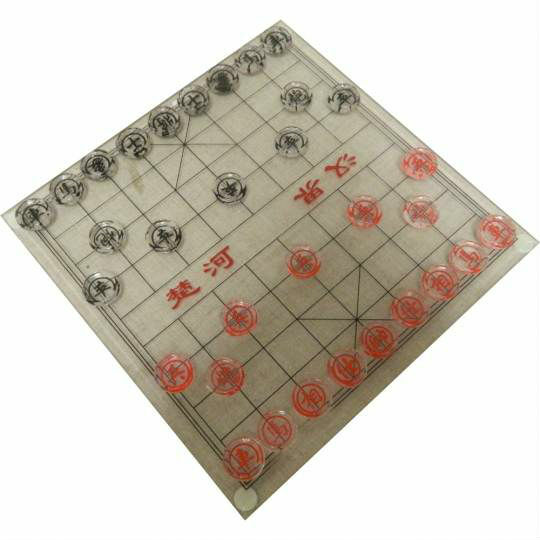 Because the board folds in half, this chinese chess set is easy to fit in a bag or purse, so you can take it with you wherever you go without a problem. The 7 ¾” Magnetic Chinese Chess Set is 7 ¾ inches square when it’s completely unfolded. When it’s folded up, it turns into a small rectangle about 7 ¾” x 3 ⅞” with a thickness of just over an inch. Each square on the board is ¾ inches square, but keep in mind that you don’t need to worry about the bases of your pieces fitting completely within that space, because on the Chinese chess board, your pieces sit on the intersections of the lines rather than inside the squares. The simple and modern design of this chinese chess set is lovely and also incorporates some traditional elements as well to appeal to every buyer. 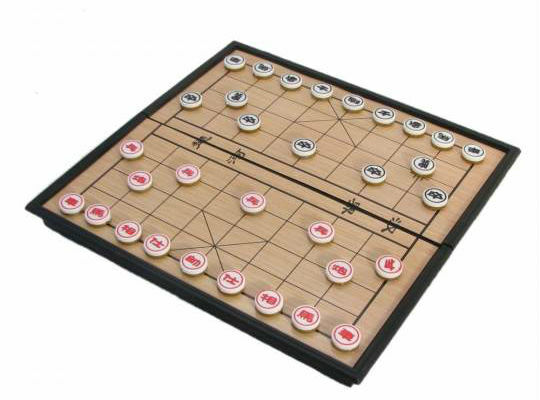 This set is about half the price of the glass Xiangqi set, making it an even more unbelievable deal! 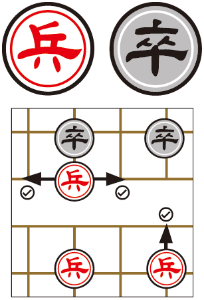 This is one of the most basic Xiangqi sets available on the market today, though that’s not to say it’s not worth having! If you’re someone who prefers to keep things simple, doesn’t want to pay extra for aesthetics, or is simply on a shoestring budget, this could be the perfect Chinese chess set for you! 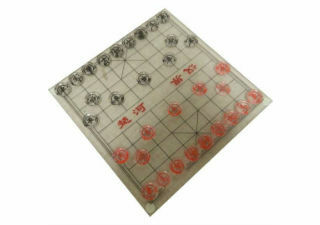 The Basic Chinese Chess Set includes a set of plastic Xiangqi pieces and a paper board on which to play the game. The setup is simple, but if you’re just looking to try out the game and see if you like it, this is all you need to get started. The set comes with a plastic storage case for the pieces, and the chinese chess board can also be folded up and stored in there as well. Obviously, paper is not the most durable material for a chinese chess board, but if something happens to it, you can always print yourself out a new one. At this price point, you could even buy yourself an entirely new set! The Basic Chinese Chess Set is extremely inexpensive – we’re talking single digits, here. 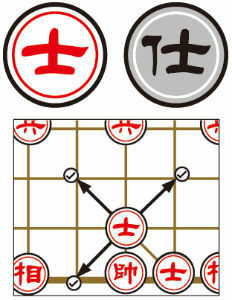 The extremely low price tag of this Xiangqi set makes the game accessible to anyone who wants to try it out. If you find yourself loving the game, you can always upgrade to a fancier set down the line! 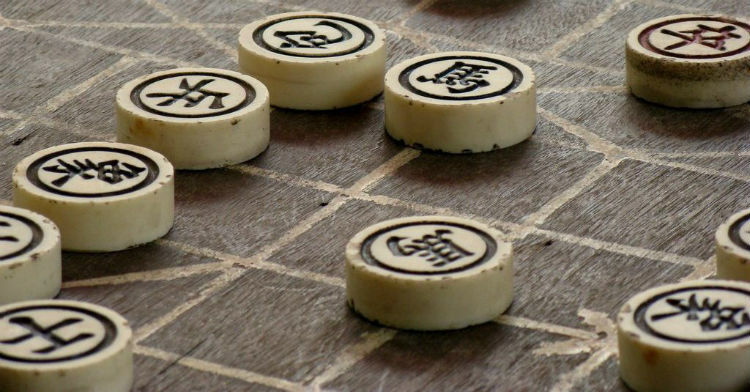 Chinese chess, or Xiangqi, is an ancient game that is believed to date back to the Warring States period of Chinese history, which began around 475 BC. Some historians believe that the game had astronomical origins, and that ancient Chinese players based the game around the movements of various celestial bodies that were visible to the naked eye and could be seen moving around the night sky at that time. Another theory states that the game was modeled after the movements of troops and armies that dominated the Warring States period. It is hypothesized that generals would play the game as a way of working out tactics, and deciding where to send their troops for maximum effect. 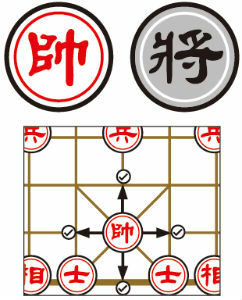 More than likely, the name Xiangqi was used to refer to several different games around that period, and they each evolved from and became comingled with one another. It’s hard to tell from contradictory historical texts, and we may never know the true origins of the game, since it came into popularity so very long ago! Regardless of how the game came about, it’s obviously here to stay. If you want to learn how to play the modern version of Xiangqi, you will first need to familiarize yourself with the board. 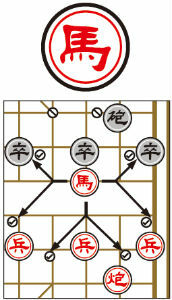 The Xiangqi board consists of 10 vertical lines, called files, and 9 horizontal lines, called ranks. The intersections of these lines are known as points. 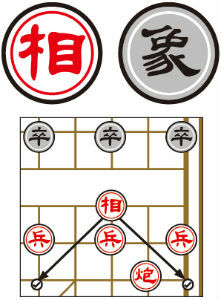 Between the 5th and 6th ranks is an empty space that divides the Xiangqi board. This space is known as the River, and it affects the movement of some pieces, but not all. In the middle of the back rows, closest to each player, is a square area marked with diagonal lines. This is known as the palace or castle. Generals – Like the King pieces in traditional chess, the general is the focus of the enemy’s attacks. When one person captures the other’s general, the game is over. The General can move and capture one point orthogonally, and cannot (usually) leave the palace. The two generals may never face each other on the same file without any other pieces in between them. 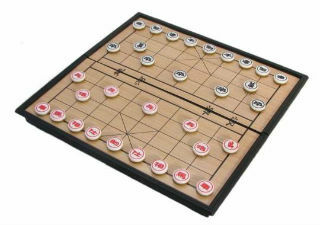 If this ever happens, the next player to move may perform the “flying general” move, in which they cross the board and capture the enemy general. This is the one time that the General can leave the palace. Advisors – Advisors are placed on either side of the General at the start of the game. They can move and capture one point diagonally, but they cannot leave the Palace. Elephants – Elephants are located next to the advisors, and they are one of the two kinds of pieces affected by the presence of the River. They can move and capture exactly two points away, but they may not jump over intervening pieces or cross the River. Horses – Horses begin the game on the outside flanks of the Elephants. Horses can move and capture one point orthogonally and the one point diagonally from where it just was. 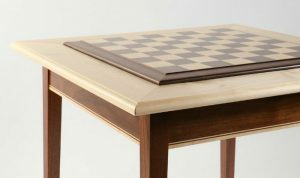 It cannot jump over other pieces like the Knight piece in traditional chess set would. 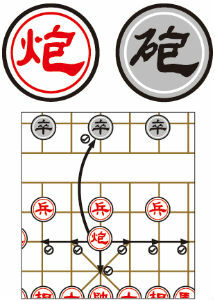 Chariots – Chariots begin the game in the far corners of the Xiangqi board, next to the Horses on the outside edge. The chariot can move and capture at any distance orthogonally, but it cannot jump over other pieces. Because of this freedom of movement and lack of restrictions, the Chariot is often considered to be the most powerful piece in the game. Cannons – Your cannons start the game on the front lines, two points in front of the Horses. Cannons move similar to Chariots, and capture pieces by jumping over another piece known as a screen. 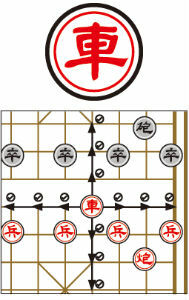 Soldiers – Each player starts with 5 soldiers, which are placed farther forward on the board than any other pieces. They move and capture by advancing one point. Once they have crossed the River, they can also capture by moving one point horizontally. Soldiers can never move backward. Now that you have the basics down, you’re ready to get started with your own game of Chinese chess! Of course, there’s much more to learn before you really get good at it, just like with Western chess. It’s simple to learn, but difficult to master. Still, if you’ve got a bit of determination and a reliable Xiangqi set like the ones on this list, you can go far!